The science of strength and conditioning has come a long way from the early days where mostly everything was being derived from bodybuilding anecdote. It’s really only 30 years or so that strength and conditioning has become its own separate entity from skill development within hockey athletes. Every year, hockey athletes are becoming more aware of the importance of strength and conditioning and how you can dramatically enhance your on-ice performance with proper off-ice work. Having said this, even in modern times there are still countries who do not have a full-time strength and conditioning coach with their teams when entering international competition. Not only is this behind the times, it’s been demonstrated to be downright unproductive. If you want to compete at a high-level, you must start training like a hockey player. The separation of strength and conditioning from skill work has presented a unique scenario because, within more enlightened teams, it has improved their overall performance because they have delegated proper time slots to work on both in order to improve overall team performance. But, in other cases you have teams and/or who do not train because they have focused all their time on skill work, or, you see trainers on Instagram who have fallen too far deep into the functional movement fad and are trying too hard to blend skill work into strength work at the same time. Don’t get me wrong, what they are trying to do is admirable. But it has gotten to the point where the more unstable and silly you look, the more effective it must be. This violates some of the most important laws and principles that we know within sports science and puts you into this grey-area where instead of doing both properly (both skill work and strength work), you are doing both wrong. More on this below. In today’s article, I want to discuss three very common mistakes I see hockey players making with their in-season programming so that you have the knowledge moving forward to avoid them. Just as important as knowing what to do, is know what not to do. Once you see where most hockey programs go wrong, you will be well on your way to seeing how you should be piecing your programming together to get the results you want to get out on the ice. When you’re looking at how the hockey industry got swept up by functional training, it’s tough to exactly determine how it all unfolded. But, in any case, it has spread through the industry like wildfire. Plenty of hockey teams and weight rooms are going as far as restructuring their entire gym to include stability balls instead of benches, and wobble board instead of squat racks. Lets also not forget to include an area for discs, Bosu’s, and anything else that makes your hands shoot out gang symbols during your working sets. These functional coaches place a sky-scraping premium on the smallest details of movement above all else and often deconstruct the simplest of exercises into a dozen different progression models, half of the time including some sort of balance device along the way so you can “engage your core” when you move. Watching some of these exercises and workouts, it’s difficult to differentiate if they’re training for hockey, or want to join the Cirque de Soleil. I’m not going to dive too far into the scientific intricacies of this inaccurate approach to hockey training as I have done so both here and here. Because honestly, I think the previous giant explanations I have done weren’t necessary for you to see how this type of training methodology leaves A LOT to be desired when it comes to creating improvements in hockey performance. While focusing on controlling your movement and stability throughout ranges of motion is important and should be a part of all programs, a problem happens when you get so caught up in these small details that you lose sight of the big picture of what hockey performance truly is. I think people are starting to understand the major flaws here though, as it seems to have lost steam over the past few years (hopefully due in part to my relentless pursuit of promoting real sport specific training). It’s not complicated to comprehend that utilizing methods that are born out of physical therapy and injury rehab do not offer the best ways in which we can improve our performance. Physical therapy and performance enhancement are two different schools of education for a reason, if you’d like to ride a dolphin in your spare time then it’s probably wise to hang out on a Bosu ball to “activate your core” to balance yourself in unstable and unpredictable environments. But, if you would rather train to improve your hockey performance then you need to train like an athlete. Not a patient going through physical rehab. Keep in mind, the true essence of functional training should be that everything you do has translation to improving your overall performance as a hockey athlete. The idea that training is only “functional” if it’s done on an unstable surface or on one leg is downright silly and incorrect. You absolutely cannot judge an exercise as “functional” or “non-functional” based solely on it meeting some arbitrary unproven criteria. Not to mention, there is literally zero research demonstrating that performing these exercises reduces your risk for future injuries during a hockey game. If you’re serious about your hockey performance, you have to start training like it. Improving performance and reducing injury risk comes down to an overall training strategy and programming schedule that works within your limits of work capacity, not an endless list of made up “functional” movements. Hockey players in recent times seem to love CrossFit. Over the last 5 years or so, the CrossFit training and methodology has received a ridiculous amount of press in the media. 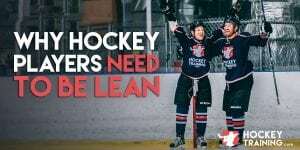 Because of this popularity, lots of hockey players have jumped on board and it has spiked the discussions between high-level coaches on what value can be brought here, and what disservice it can offer our athletes. This single statement is a perfect representation of the difference between exercising, and training. The idea that everyone needs the same type of fitness and that training doesn’t different from one sport to the next is so wildly incorrect that I wouldn’t even know where to begin. 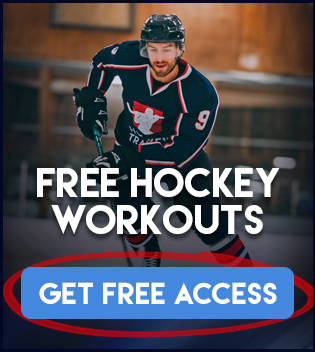 It should seem totally obvious that if you’re training to be a hockey player, then you probably shouldn’t be on the same damn program as an elderly person with heart disease. These umbrella statements that cover such a wide range of demographics completely ignores the science of training and how the body adapts to the stress you’re placing on it. Building work capacity for the sport of hockey is different than building work capacity for a powerlifter, or marathon runner, or anyone else you can think of. There is no such thing as a “single approach” to ultimate performance. This is a slap in the face towards the decades of research behind the fundamental principles of sports science and the well-documented effects of periodization for sport performance. You must train properly in order to prepare your body for hockey specific workloads and intensities over the course of a competitive season. This requires specific hockey training and an effective periodization strategy. The most effective strength and conditioning programs in the hockey training world are the programs that coordinate all aspects of skill, strength, and conditioning. You have to understand that the areas of strength development, conditioning development, and skill development—are not separate compartments in your body when it comes to the accumulation of fatigue. All of these sessions create an accumulation of fatigue and they all need to be taken into consideration when creating a program that you can still effectively recover from. An important lesson here: I don’t want you to separate your skill work and strength work. I want you to see them as an extension of one another. This means that you need to realize that training should be coordinated and integrated, not disjointed and separated. For example, if you’re working on improving your alactic power output, it would be wise for your skill development to utilize these types of intensities and volume requirement as well. Or, if you’re working on improving your aerobic base for hockey (which I deem as a minimum 60bpm or less) then your skill development work should incorporate these same types of lower intensity intervals. The closer you get to the season and/or playoffs (the two-major peaking point of every season), the more coordinated your skill work and off-ice work need to be. Any type of training you do will create very distinct effects on your physiology, these effects all need to be taken into consideration when designing your in-season and offseason programming. Which is one of the main reasons I created an entire “auto-regulation” section within my in-season hockey program so that athletes could learn how to bob-and-weave with the punches of their active competitive season schedule and still make sure they’re recovering appropriately for optimal hockey performance. Balancing this appropriately can be the difference between your strength and conditioning program helping you or hurting you. 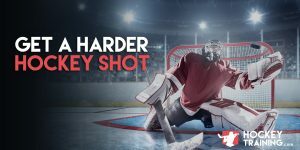 I hope this article was able to open your eyes to some of the most common mistakes found within in-season hockey training. Use them as a compass to know where you should gravitate to, and where you shouldn’t. To be a better hockey player, you need to train like one. Check out our High-Performance In-Season Training Program here if you’re interested at performing at top levels this hockey season! 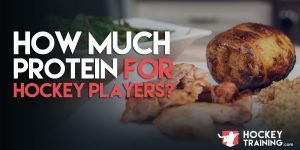 How Much Protein Should Hockey Players Be Having?